With over 30 years, in the world of Marine Products, Delma Marine has grown from a small local shop in Abu Dhabi to the leader in the Marine field in Middle East with showrooms in Abu Dhabi and Bahrain. Established in the late 1970, Delma Marine now includes supply of Marine Products, including Boats, Yachts, Cruisers & all kinds Accessories. We also do maintenance and have our own Workshop next to our showroom. 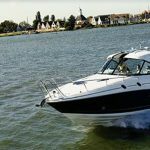 We deal in quality products which help you to enjoy your water activities, whether it is Yachting, Fishing or even Scuba Diving.